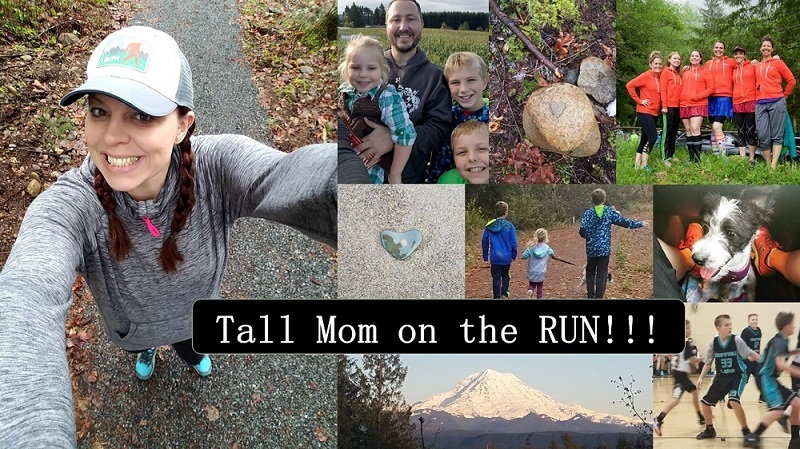 Tall Mom on the RUN: Go BIG or Stay Home? Are you afraid if you don't run big you will lose your passion? What if you directed that energy into your coaching passion. Maybe start a local amateur running group and train them towards their first 5k. Maybe a Duathlon would be a good challenge? It's something I want to try next. I completely understand how you feel. I peaked a long time ago at averaging b/n 6:30-7:00 min miles and now the thought of hitting that is UNHEARD of. I feel like there are so many of us right now going through this feeling of "what do I do" about running, blogging, etc... Change is in the air and it's more than just summer turning to fall. Listen to your heart and go with it... whatever you decide will be the best course of action for right now and won't stop you from adjusting along the way! For myself, I always like to take a break from workouts and exercise. I try to give myself at least a week off every year when I don't do any form of "planned or hard workouts". It gives me a renewed sense of enjoying fitness afterwards. I think you know the answer, you're just hoping someone will tell you it's OK.
Mel, it's OK. Follow your heart. Hugs Buddy! I like the idea of pacing friends, just sayin'. Do you get Running Times? This month's issue has an article about almost this exact situation. Read it if you can because I'm going to fail miserably in capturing all of the important details and points...but...one of the things she did was to never repeat a course, so she never had to compare her times on the same course. She also focused only on the fun of the event in the moment, not on the watch. She stopped announcing upcoming races and stopped reporting on results, instead just sharing what made in enjoyable. Like I said...it's better if you read her words. In the end, I think she found another option to either going big or staying home that makes her happy. Take a break! If you're starting to feel stress about running then you need some breathing room. Just as your muscles need to recover, so does your mind. Don't stop running, just stop running races for awhile. Run for the sake of running and in time you'll be back on going strong. One good tip, do some runs without a watch/music/gps or anything else that you associate with races. Just get out there, run, and think about why you got into running in the first place. I like what Amanda said. I will look to you for advice, commentary and insight regardless of whether you are training for your first ultra or coaching Muscle Man to his first half. I think as former college athletes, we put more pressure on ourselves to go hard when we commit to an event. I agree with Tricia and Tonia...that heart of yours won't lie and WE ALL LOVE YOU! I'm with T and T :) I have tons to say about this in general and to you specificallly :) Remember…I'm really old ;-) I peaked 20 years ago! I'm still here, still having fun and still going as big as I am able…given the constraints of my current life and mindset :) You are one awesome lady! I feel you on this, though not for the exact same reasons. I'm (surprise!) pregnant with my third kiddo. I wasn't expecting/planning it so I was training hard for a fall marathon when I found out. It took me a few weeks to adjust to the idea of The No Plan Running Plan but I'm actually digging it. I am going by time instead of distance/pace. Post-baby I am thinking of trying some triathlons to mix things up: guaranteed PRs!! And even though I basically need to swim with floaties and I don't own a bike, I figure it's a new baby, a new challenge, a new way to see what this Old Girl can do! Good luck to you, whatever you decide! I've been trying to throw myself into new things like trail racing and different distances. I always try to keep it fun. If I happen to PR, then great! If not, that's fine, too. As long as I know I gave it the best effort I could on that day, I'll be happy. Not every race can be a PR. A break may be a good thing. It can give you some time to recharge your batteries and, like you said, reconnect with your family - maybe explore other fun race options in your area (not necessarily go out for a PR, but just have some fun). A casual look at a lot of my blogs lately shows that many of you seem to be suffering from post-Hood to Coast blues. There is a lot of talk of uncertainty about goals, abilities, plans, and running desires. Take some time, enjoy the run, reassess later in the winter, as you firm up your schedule for next year. H2C was a big deal, and I kind of get the impression that many of the participants are feeling a little let down in the immediate aftermath. Everyone needs to recharge, but if you want to keep going I think you should focus more on running for the pure joy of it! If you were playing sports in highschool and your team this year wasn't as good as last years, you wouldn't just quit! Instead you would do your best and enjoy being on the court with your friends! sometimes, running becomes about the numbers-time, distance-and not about the 'time', the fun time you have...I trully enjoy running, without a training schedule or race to think about...and getting my daughters out there with me-even better! enjoy running, enjoy family, enjoy you! In my world, it is family first. Yes, it is great training for my first marathon and all my halves have bees awesome. But it is more important to stay connected to the family so that you all still have each other in 50 years! It will be worth pulling back. Plus, you'll love the race even more when you do dig deep and go strong. I didn't choose to "stay home", my achilles decided for me, but I'm finding that I'm digging not having a training plan. I run when my achilles lets me at the pace it lets me. I've begun doing a lot more cross training and biking with my boys. Surprisingly, I'm doing just fine that way. Someday I'll probably go BIG again, but for now it's ok. I agree that family is first for sure. There are times in every mom's life when you know the family needs you more than other times. Which can mean training (or work, or anything else) can wait. Do what you feel you and your family need right now. You wear so many hats in your life. And no matter what, we'll all be here with you, understanding and supporting you! You've been saying a lot that you feel you need to be home more, so maybe a break from hard training and racing is good right now? Could you ride out this year without a schedule and see how you're feeling in January? I have been at this running thing a bit longer and I am older so my views might be different however, I don't agree at all with go big or go home being choices to be decided between. You can take your running where ever you want. Maybe it's not about PRs for a while, maybe it's more about enjoyment, maybe it's about family challenges, maybe it's not about racing or maybe it is. I think first and foremost, running should be done for fun. Not measured in success or failure based on the last time you race X distance. After you have been running long enough there will come a day when you simply can not run as fast as your fastest paces and you need to know now that you will be okay with that because you have LOVED the running for more than the PRs it gave you. I agree that you already know what you want to do. It's okay to just do it. Whatever you chose. I agree with the rest of the people. Follow you heart. I think for quite a few months you have eluded to the fact that your heart is at home. And THAT is ok! You are an amazing runner. You are talented. But your running will follow when you nurture your home. It will help you to see new goals and find that "love" of running all over again. We support you and of course will continue to read, because we love who you are, not what you run. I am thinking that you already know what you want to do and that you should do it. Sometimes not having a plan is good Mel. Good luck! xoxo! P.S. I would read you if you were running or not. You are quite an inspiration. Always listen to your heart. It's always interesting to take on new roles in life and it can be hard to adjust when we feel like there needs to be a change made. Do what is right for you and your family and see where life takes you. And wherever that may be, enjoy that journey! Ok, I know I just commented, but then I just read this and HAD to share. "Your time is limited, so don't waste it living someone else's life. Don't be trapped by dogma that involves living with the results of other people's thinking. Don't let the noise of others' opinions drown out your own inner voice. And, most important, have the courage to follow your heart and intuition. They somehow already know what you truly want to become. Everything else is secondary." Why do you have to decide between either two- I think you need a little of both- GO BIG sometimes is good to keep your competitive streak/goals/enthusiasm for the race, and sometimes we need to Stay Home, because at the end of all of our lives we will never be able to get back memories of time with family members and friends. I think a combo of both is what makes a lot of us running moms happiest.